Filed under higher-education on October 25, 2012. Within the past year, our statewide community college system has hired five of fourteen new regional academic officers (RAOs) and we have another on the way in September. Given this large number of new RAOs, it was decided by the Provost’s office that they would conduct a new RAO training session. This session would occur at our Central Office location and be coordinated/planned by our Provost’s office. I’ll be the first to admit, that I usually groan when I hear that someone is planning my professional development; however as it turns out, this session was probably the best professional development activity I have attended in my twenty years with the college and surely beats the sessions I’ve attended in the military. My thoughts were echoed by my four peers in a recent e-mail conversation, so it must be true.“Why,” you may ask? What was the secret sauce? Let me share my thoughts. Attendee driven agenda. About a month prior, all attendees were asked what topics we wanted to “discuss.” A combined list of the top items were placed on the agenda. This could have turned into a “here’s what we THINK you need” as is often the case in so many professional development activities. Thankfully, we had input on what topics actually mattered. “Discuss” being the operative word. As I mentioned above, we were asked what we wanted to discuss. There was no preaching, no force feeding of the cool-ade. This was an opportunity to put the key topics on the table and discuss. I don’t believe during the whole time, anyone spent more than 5 minutes in a soliloquy. A topic was quickly introduced and then it was discussion time. And there was plenty of it. Often it was lively and spirited, which leads me to my next point. Effective moderator. Our moderator, the Vice President for Academic Affairs for the college, was a previous RAO. On top of that, he was an excellent facilitator. He could have been an “instructor” who laboriously worked his way through the material with nary a chance for interaction. Instead he took a true facilitator’s role and kept us and our guest speakers on track while providing time for feedback and discussion. He is also very approachable and cares about the college and about helping us succeed. You felt the passion he had for academic affairs and for mentoring/coaching. Much food consumed. Lunch/Dinner/Breakfast/Lunch were provided along with copious amounts of coffee, soda and water. It’s those little things that keep you refreshed. Food breaks along the way allowed the discussions to veer “off topic” and often get to the real issues. Our dinner at a local establishment allowed our social bonds to strengthen. Of course, I had to tack on an extra mile or two to my run afterwards. Technology allowed. While we were sensitive not to overstep our bounds by reading our e-mail/tweets/texts/etc, technology was not outlawed. Everyone understood that our jobs often require a quick checkin and answer back to our home campuses. All of us had our technology (mine was a new Nexus 7 tablet, but that’s another blog post) on the table and there were often discussions where that technology came in handy to research trends, policy, curriculum and the like. Peer group created. Sure I could call upon several of the other more experienced college academic officers for advice; however, now I have a core group of peers who probably have a better handle on my current challenges and as we mature in the position together, will better understand these challenges going forward. So what did I learn from this RAO training? To put it succinctly, a lot and not all of it about being an RAO. The focus on this post was not so much what I learned to become successful as an RAO (I’m still a bit fuzzy about this one), but rather what I learned that made this professional development activity successful. I plan to reflect on this post further and implement as many of these strategies as I can to ensure productive professional development activities for our regional faculty. 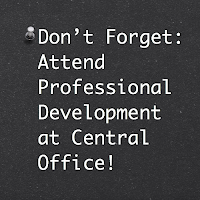 Have you attended a productive professional development activity lately? Tell me about it in the comments below.